In celebration of Women’s History Month, we are thrilled to unveil the official guide created in collaboration with The People’s Supper — Pro-Voice Abortion Conversations at the Table: A Story Sharing & Listening Guidebook. One of the ways we can end abortion stigma is by talking about it, so let’s start a cultural transformation at our dinner tables in honor of women around the world. This new guide gives you the tools, tips, and inspiration to host a dinner in your home. The People’s Supper has made this easy: sign up to host a meal in your home, or join another meal that someone has already planned. Need some more tips and pointers for hosting your dinner? Our Executive Director, Susan Chorley, and Micky ScottBey Jones of The People’s Supper and Faith Matters Network hosted a web-based training for people interested in hosting these conversations in their communities. We’ll make the link available to you soon! Thank you for joining the movement to end abortion stigma and raising the voices of those who have experienced abortion first-hand. We can’t wait to hear about the conversations that happen around your table. 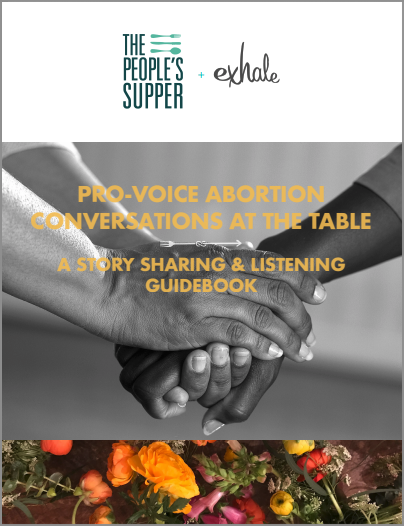 In honor of #WomensHistoryMonth and in partnership with #exhaleprovoice, #thepeoplessupper brings to you a gathering guidebook for talking about abortion. Healing suppers are an opportunity to talk and process in community. Go to thepeoplessupper.org/resources/ to download the guide.